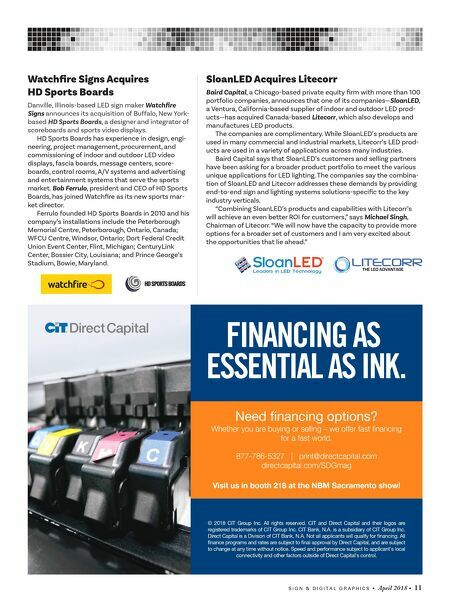 S I G N & D I G I T A L G R A P H I C S • April 2018 • 11 Watchfire Signs Acquires HD Sports Boards Danville, Illinois-based LED sign maker Watchfire Signs announces its acquisition of Buffalo, New York- based HD Sports Boards, a designer and integrator of scoreboards and sports video displays. HD Sports Boards has experience in design, engi- neering, project management, procurement, and commissioning of indoor and outdoor LED video displays, fascia boards, message centers, score- boards, control rooms, A/V systems and advertising and entertainment systems that serve the sports market. Bob Ferrulo, president and CEO of HD Sports Boards, has joined Watchfire as its new sports mar- ket director. Ferrulo founded HD Sports Boards in 2010 and his company's installations include the Peterborough Memorial Centre, Peterborough, Ontario, Canada; WFCU Centre, Windsor, Ontario; Dort Federal Credit Union Event Center, Flint, Michigan; CenturyLink Center, Bossier City, Louisiana; and Prince George's Stadium, Bowie, Maryland. SloanLED Acquires Litecorr Baird Capital, a Chicago-based private equity firm with more than 100 portfolio companies, announces that one of its companies—SloanLED, a Ventura, California-based supplier of indoor and outdoor LED prod- ucts—has acquired Canada-based Litecorr, which also develops and manufactures LED products. The companies are complimentary. While SloanLED's products are used in many commercial and industrial markets, Litecorr's LED prod- ucts are used in a variety of applications across many industries. 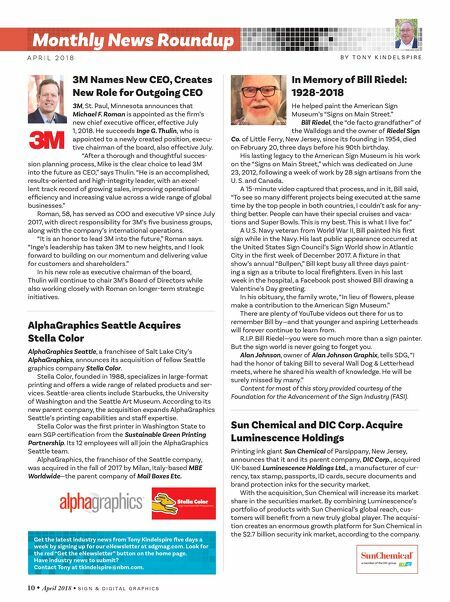 Baird Capital says that SloanLED's customers and selling partners have been asking for a broader product portfolio to meet the various unique applications for LED lighting. The companies say the combina- tion of SloanLED and Litecorr addresses these demands by providing end-to-end sign and lighting systems solutions-specific to the key industry verticals. "Combining SloanLED's products and capabilities with Litecorr's will achieve an even better ROI for customers," says Michael Singh, Chairman of Litecorr. "We will now have the capacity to provide more options for a broader set of customers and I am very excited about the opportunities that lie ahead." Need nancing options? Whether you are buying or selling – we offer fast financing for a fast world. 877-786-5327 | print@directcapital.com directcapital.com/SDGmag Visit us in booth 218 at the NBM Sacramento show! FINANCING AS ESSENTIAL AS INK. © 2018 CIT Group Inc. All rights reserved. CIT and Direct Capital and their logos are registered trademarks of CIT Group Inc. CIT Bank, N.A. is a subsidiary of CIT Group Inc. Direct Capital is a Division of CIT Bank, N.A. Not all applicants will qualify for nancing. All nance programs and rates are subject to nal approval by Direct Capital, and are subject to change at any time without notice. Speed and performance subject to applicant's local connectivity and other factors outside of Direct Capital's control.